Percentage compositions of typical type metals. 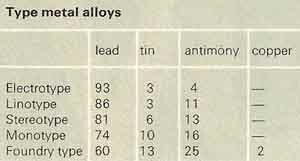 The hardest alloys are nearest the bottom. Type metal is any of various alloys of lead, antimony, and tin, easily cast to make printing type. Owing to the presence of antimony, type metal expands on solidifying and thus gives a sharp cast. Type metl contains 2.5–25% lead and 2.5–25% antimony; both tin and antimony lower the melting point, which is usually between 240° and 250°C (460–475°F).